Is all-natural always the way to go with your beauty routine? Maybe, maybe not. If you’re not confused by the wide range of preservatives used in cosmetics these days, maybe you haven’t been reading the labels. Along with all of the main ingredients designed to do something wonderful for our skin is the addition of typically synthetic preservatives. In recent years, preservatives in cosmetics have been both celebrated and vilified in the evolving worlds of science, product development and consumer safety. Potassium sorbate is the specific preservative that caught my attention when we discovered that my then toddler was getting eczema frequently. I documented a pattern that pointed to potassium sorbate in both food and personal care products and what seemed to be behavior differences in addition to skin problems. I noticed a few other things triggering reactions too, and had no way to properly investigate any effects that might have come from two or more ingredients taken in together. We specifically had a couple of scary incidents with lotion and hair conditioner that caused a bright red skin reaction. We’ve erred on the side of caution, especially avoiding processed foods with preservatives as often as possible. And recently, when she did a skin test with a bit of hair conditioner containing potassium sorbate, it was a pleasant surprise to see that it did not cause redness or itching that time. These experiences, coupled with my sometimes sensitivity to skincare products, prompted me to explore further the concept of preservatives in skincare. While avoiding preservatives in food is a rather straightforward decision, avoiding preservatives in cosmetics is more complicated. The main reason they are needed is for defense against bacteria and mold contamination. No one wants harmful growth of any sort in their makeup or lotion, do we? You’ve probably heard horror stories about contaminated eye makeup causing infections and how we all need to replace our mascara frequently. Any sort of liquid cosmetics based in water are candidates for developing harmful bacteria or mold either in the original product or at least after we’ve left items in a hot car or dipped into them with our hands. Not everyone agrees that potassium sorbate is harmless. A 2009 study looked at genotoxicity or DNA damage from potassium sorbate in human lymphocytes. Blogger Stephanie Greenwood of Bubble & Bee Organic has noted that this study as well as concerns about the chemical being an irritant have persuaded her to avoid the substance. Potassium sorbate is the potassium salt of sorbic acid, made synthetically today. Miessence North America independent representative Erin Ely of Ely Organics shares the concern that potassium sorbate should not be absorbed by the skin. Her perspective is as a top sales representative for Australian-based Miessence, which states that it does not use synthetic preservatives. How does this cosmetics company meet stringent guidelines for preventing mold or bacteria growth without added chemicals? Ely explained, “Our preservation system has to do with the ingredients we use, the order in which they are mixed together and how the product is made. Essential oils are part of this. We challenge test every product we have to a shelf life of 30 months, although they are not dated that far out. They usually have a dated shelf life of 18 months. They are manufactured fresh every 30 days, which is unheard of in the industry!” The base for liquid Miessence products is not water, but aloe vera. Others who want the all-natural, no-chemical-preservatives approach to cosmetics are following a trend to make their own products at home. Just as with any do-it-yourself project, concocting your own cosmetics comes with its own risks, from bacterial contamination to sensitivities to essential oils. What if you’re too busy to craft your own cosmetics and too budget-minded for the most expensive boutique products, but you still want the best quality ingredients on the cosmetics market? Two companies that go above and beyond in quality assurance efforts to use natural, uncontaminated, gentle ingredients are British-based NYR Organics and US-based Beautycounter. Amid all of their responsibly sourced ingredients, both also use some synthetic potassium sorbate as a preservative for some products, and we asked them why. The concern that some cosmetics makers may be hiding preservatives from source ingredients was also expressed by Beautycounter‘s Head of Safety and Environment, Mia Davis. “Our company is bar none in terms of transparency and ingredient safety,” Davis said emphatically, “we commit to never, ever hiding any ingredients! 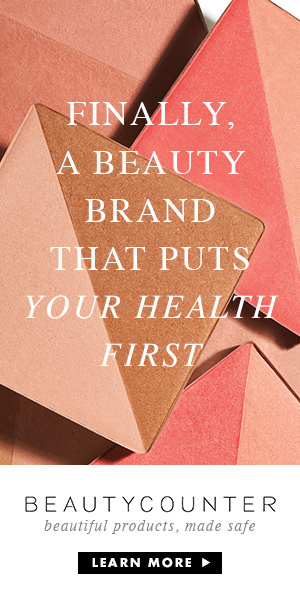 We look at every single ingredient and we do an assessment on the safety information, also on a formula by formula basis.” All of Beautycounter’s products are made in the USA, with the exception of a new powder color line, which Davis said will be made in Italy to meet the company’s stringent quality standards. Like NYR Organic, Beautycounter also offers many oil-based products like facial oils and balms that don’t require an added preservative. The company’s “never list” declares that parabens and formaldehyde releasers are not allowed on the preservative menu. Davis says formulations for aqueous-based products can include multiple preservatives such as potassium sorbate and others, used in the lowest limits necessary to meet safety standards, with rosemary oil sometimes used as a preservative booster. If some of the most transparent, wellness-minded cosmetics makers in the industry are still using potassium sorbate, does that mean it’s been proven safe? As Davis well knows from her years of working previously with the Campaign for Safe Cosmetics, “there’s a huge lack of safety data out there.” Several watchdog consumer groups have long demanded that government oversight be more stringent on consumer products, with a need to look at the long-term health impacts of chemicals in cosmetics. More testing and information sharing at the ingredient level would seem to benefit most cosmetics makers and their customers. For those of us with concerns about side effects or sensitivities from potassium sorbate, we’d like to see more data confirming its safety. Yet, it’s understandable that common sense may always dictate some type of added preservatives in at least some cosmetics. For now, the most transparent companies open themselves up for scrutiny even as they seek out the safest cosmetics and make the most prudent choices they can about preservatives. This article is not intended to offer any professional medical or consumer advice of any kind. This is a news/information article and not an advertisement or endorsement for any particular product. Article copyright FlourSackMama.com 2014. All rights reserved.